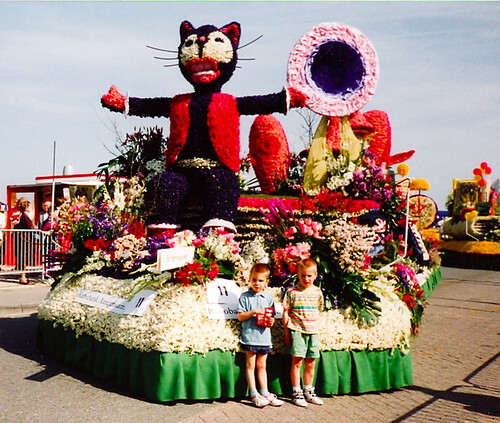 Flower parades in which floats and other vehicles decorated or covered with flowers are paraded through the streets of a town are common annual phenomenon in many countries especially in Europe and USA. 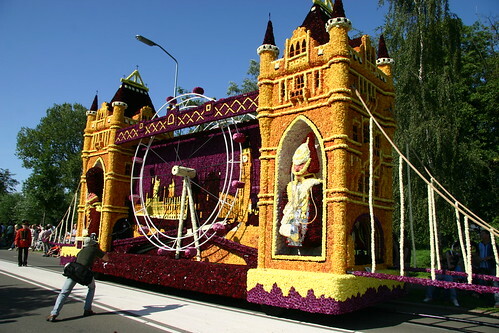 The most famous flower parade is perhaps the Rose Parade in Pasadena, California which always takes place on January 1. 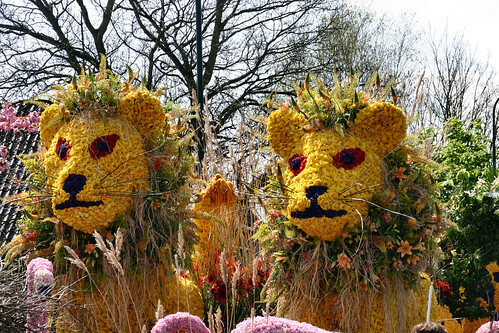 Holland is known to hold maximum number of floral processions in many different places at different time of the year mainly from the spring to the autumn. 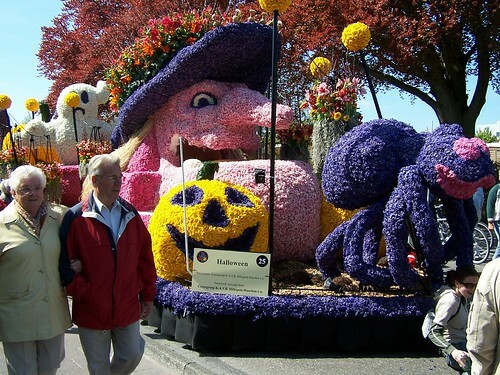 Each flower parade - called a "Bloemencorso" - has its own history. The largest is the Dutch parade at Zundert, which occurs on the first Sunday in September. The floral decorations are made mainly from dahlias and as per its web site it is also largest in the World. 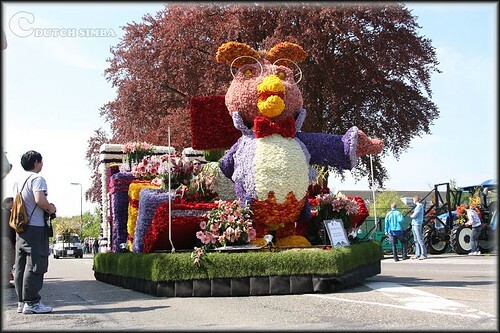 This post is about recently concluded parade - Bloemencorso Bollenstreek (meaning the flower parade of bulb-growing area) - the first parade of the season in The Netherlands. 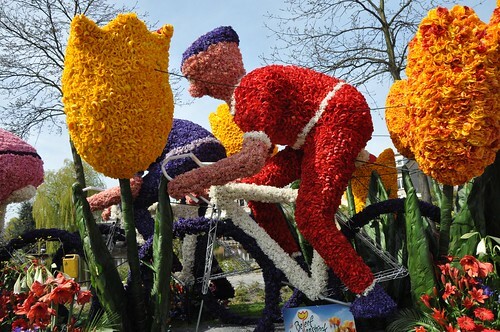 It is also the biggest parade Europe (and perhaps in the World) as it has longest route of about 40 kilometres. 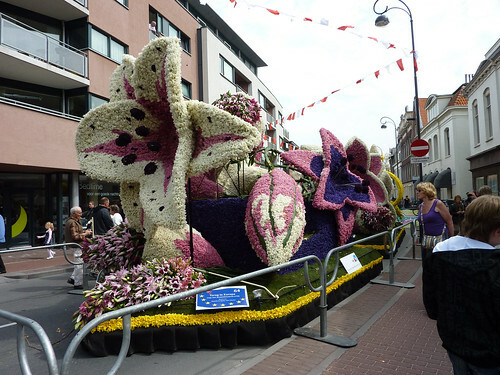 The Flower Parade starts from Noordwijk, winds through the bulbous flower growing region including the famous Keukenhof, world's largest flower garden where approximately seven million flower bulbs are planted annually and ends at Haarlem, where the floats are kept on display till the next day. 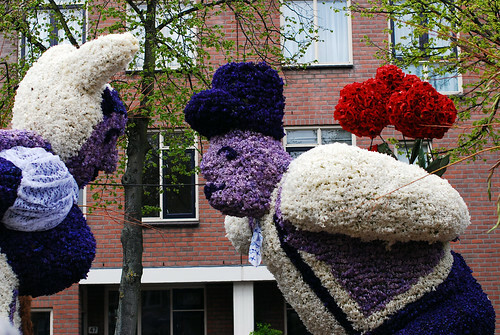 The floats are created with more than 1.5 million hyacinths and thousands of narcissus and other tuberous flowers. Each year a new theme is announced for the next year. In the recently concluded parade the theme was "Journey Through Europe". On the eve of actual start, there was an illuminated parade in the Noordwijkerhout. Actual parade started on 24th April 2010 morning from Noordwijk and reached Haarlem in the late evening passing through the towns of Sassenheim, Lisse/Keukenhof, Hillegom, Bennebroek, Heemstede. The procession comprised of 20 large floats and more than 30 decorated luxury cars, accompanied with marching bands. The parade is a big tourist draw and is watched by several thousands, not only at the starting and the end point in Haarlem but also along the entire route. Here are a few images of the latest 2010 and the earlier parades. Credits: I am thankful to Mr. Anwar who e-mailed me info about this beautiful floral pageant. Thank you Mr. Anwar.